With the festive season kickstarted and rising fad for a ‘bigger’ ‘smarter’ TV you might be beguiled to buy a new TV. And if you happen to be one of the meticulous consumers who carefully examines spec sheet before buying a TV, you would have certainly come across something called HDR. HDR stands for high dynamic range and it significantly expands the range of two important factors—contrast ratio and color accuracy. Thus, bright parts of the image get much brighter. So, it seems image possesses more depth. Color range expands to show brighter blues, greens, reds and everything in between. For example, HDR content of an evening campfire shot would have subtle details in the flame rather than just appearing blown out. With the HDR you can identify the objects that are barely lit in the gloomy surroundings at the edge of the frame. Thus HDR-compatible movies can push TVs to their limit, with brighter highlights, perfect blacks and wider color gamut. To understand HDR in more detail we need to first understand the contrast ratio. Contrast ratio is a crucial parameter determining overall picture quality, but it is often overlooked or barely understood. Although it’s not something easy to find if you’re checking out TV from a big store or mall. Because a salesman over there would cajole you with clichés like ‘higher definition’, ‘more pixels’, and ‘rock bottom prices’. Seldom he will shed light on the contrast ratio of the television. But browsing TV models online you would often read something called contrast ratio if you carefully peruse the specification section. Contrast ratio is essentially the difference between the brightest white that a screen can produce and the darkest black. So, it means to how much brighter is the brightest point to the darkest point on the display. Thus, if the contrast ratio is 1000:1, it means that the brightest point (white) is 1000 times brighter than the dimmest (black). It is important because having the correct brightness on different areas on screen is critical for making dark areas look sufficiently dark without losing detail. To better reckon optimal visibility in bright areas, think of a night shot of city. Screen with a good contrast ratio will clearly show you a dark night sky while making the detail of the city lights stand out. On the other hand, if your screen’s contrast ratio is too low the entire scene will be less detailed and more washed out with greyish tinge lacking a proper pitch-dark black. Contrast ratio and color accuracy are arguably two most important factors determining how good the TV is with the display quality. Contrast ratio indicates the extent of brightness and darkness and everything in between. Color accuracy on the other hand determines how closely color on the screen resembles the real life. If you put two TVs side by side, one with a high contrast ratio and more color accuracy, and the other with a higher resolution (more pixels), the one with greater contrast ratio will be picked by most of the viewers. HDR essentially works to improve contrast ratio and color accuracy. If the explained mathematics goes beyond the realm of your understanding, an analogical picture below would give you a more intuitive understanding of dynamic range. A non-HDR TV is like plain group of colors like in a standard crayon, it would show only a handful of colors: red, purple, pink, orange, yellow, green and blue. But an HDR TV has a much more dynamic range that would produce more range of colors. It will not just show a purple but would be capable to show nuances of purple in form of shades like maroon, lavender, orchid, plum, eggplant etc. This implies you would get much more vivid and detailed picture on an HDR TV running an HDR content. Contrast is measured by the difference between the brightest whites and darkest blacks a TV can display on its screen, also measured as candelas per square meter (cd/m2), better known as nits. Nits is a more preferred unit in TV industry to indicate the brightness of a display. To get a better perspective light from a single candle is tantamount to 1 nit. Now the ideal low end is 0 nits signifying a pure dark black. This sounds good from a theoretical perspective but its difficult to achieve perfect black of 0 nits. Thankfully with the invention of on OLED displays this is practically achievable. Ordinary TVs without HDR comes with standard dynamic range TVs capable of producing 300 to 500 nits of brightness. This is where HDR TVs up the ante quantitatively. Premium HDR TV models can display upwards of 2,000 nits of peak brightness for HDR highlights. In the recently concluded biggest international consumer electronics event, CES 2018, Sony showed off a prototype TV capable of a mind-blowing 10,000 nits of peak brightness! One of the important things to bear in mind is that TV HDR is not the same as photo HDR. People often think they are one and the same. So, let’s clear up some confusion first. Though both result in images having a greater contrast between light and dark, but the way they work is different. Smartphones with HDR camera capabilities utilize HDR by combining several photos taken during a single burst. In smartphone HDR separate photos are taken at different light exposures. These are called stops, and the amount of light is doubled from one stop to the next. First stop begins with an extremely dark image, the last one ends with an exceptionally bright. When all the images at different stops are merged they lend better luminosity to the final HDR picture. But that’s not exactly the case for TV HDR. Yes, you’re still getting a wider color gamut and contrast ratio, but that’s not out of mixing of several images with varied light exposure. In case of TV it has to do with the way an image is displayed on the screen and the source content used. I hope by now you would have understood what’s HDR and must even be ready to rock-and-roll with a new HDR-powered TV. But before you jump the guns you must bear in mind that the HDR is a two-way traffic. Merely having HDR technology won’t simply take your TV viewing experience to the pinnacle of visionary delight. Even content needs to be HDR. The first part, the TV is pretty straightforward. You can easily confirm HDR compatibility by reading the spec sheet of the TV. HDR-enabled TVs produce more light than a conventional TV in certain areas of the image. Of course, making TV brighter and more colorful would cost you more and many HDR TV will give a bang for its buck. But hold on. Just because a TV is HDR enabled doesn’t guarantee that it will outperform all the non-HDR TVs. The HDR label signifies that the TV will be able to display HDR movies and TV shows, but not how well. The core of HDR arguably lies in the content. To truly perform to its potential, the HDR TV needs HDR content. Thankfully with the increase in the rate of video consumption and mushrooming OTT (over-the-top) industry, the amount of HDR content is growing fast. The major OTT providers, Netflix and Amazon have HDR content. Another source of HDR are UHD Blu-ray discs. But bear in mind that you’ll need a UHDBD player to play these discs. HDR is the latest technological innovation in the TV world to improve visual aesthetics of the streamed content especially TV shows and movies. The good news about HDR are plenty, prominent being in its ability to bring out the best of the picture/scene on the screen. But is there any bad news associated with HDR? Well, if multitude of options confuses you then I have bad news for you. With the rising popularity of HDR there is start of virtual HDR format war as the companies are working on to bring their own HDR. When HDR was new only two formats, HDR10 and Dolby Vision, used to rule the high-tech TVs but now there have been other formats as well. So, let’s cover them one by one. HDR10 is the most common and easiest to implement format of HDR. It is open source, meaning manufacturers don’t need to pay any additional licensing fee to have them on their HDR-compatible TV, just like the Android OS. HDR10 is close to what we can call a standard HDR format. If your TV supports HDR then it supports HDR10 by default, because every HDR TV can decode HDR signals coming from HDR source. You may wonder why it’s called HDR10? 10 indicates that this HDR format supports maximum 10-bit color depth. 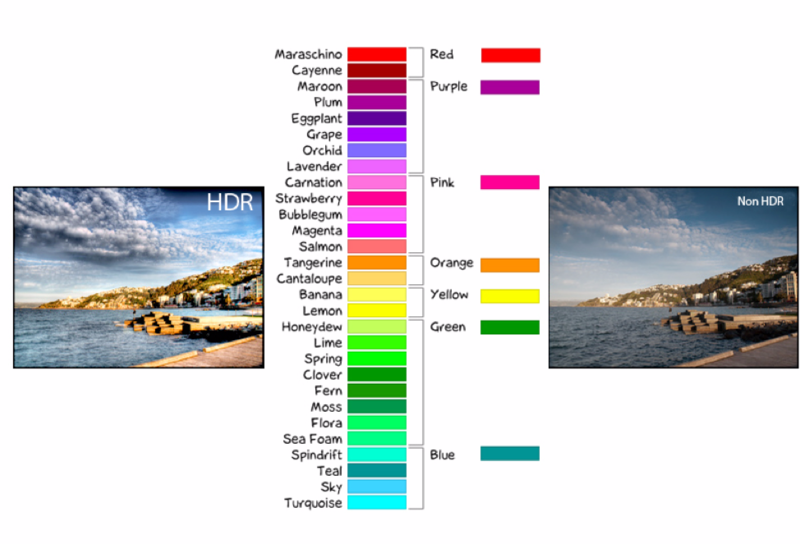 This translates into approximately 1 billion color visibility on the HDR TV. Bit color depth describes the amount of graduations of colors in an image. A non-HDR screen is usually of 8-bit which allows support of up to 16.7 million colors. The drawback of HDR10 format lies in its meta data processing. HDR10 format uses what’s called “static” metadata. Meta data is an additional data supplied to the TV which tells it how to show the HDR content. Static metadata is one in which these instructions are embedded only once inside the movie or a show. It is different from dynamic meta data which is present in Dolby Vision which I am going to cover shortly. Static meta data is a single instruction file whereas dynamic meta data gives instruction per scene or per frame basis. To better understand consider this: A single static instruction would say “whenever there is jump scene this is how high” to the TV in its instruction to display HDR content. A dynamic meta data on the other hand would instruct the TV based on the individual scene to how high it should for individual jump scenes. Static metadata follows one-size fits all approach whereas dynamic meta data does the distinctive processing based on type and genre of the scene/show. Dolby Vision is more advanced HDR format. But the catch is, it is proprietary. TV manufacturers would need additional hardware/software or more specifically Dolby decoder to make Dolby Vision HDR work on their television. They will also need to pay licensing fee to Dolby for it. This fee actually translates into improved picture quality because Dolby Vision support 12-bit color depth instead of just 10. Though this might not sound that big improvement but when it translates to color reproduction, Dolby Vision HDR TV are capable of producing up to 68 billion colors as opposed to 1 billion colors by HDR10. 12-bit color depth is not just about HDR, it has also to do with the display panel. Currently most of the panel supports up to 10-bit color depth panel. So, viewing a Dolby powered HDR on it won’t bring out all the goodie you expect from a Dolby Vision HDR. Presently LG is the major proponent of Dolby Vision HDR TV. This is the newest form of HDR which works on the shortcoming of HDR10. Samsung has been the major player working over its development and other manufacturers like Panasonic, Philips and TCL have pledged to bring out this format in their upcoming televisions. HDR10+ uses dynamic meta data like Dolby Vision. This allows fine-tuning on how HDR looks not just for a whole movie in singularity, but all the way down to per scene or per frame basis. This in turn allows the filmmakers to add more nuances to their scenic detail for a more enthralling viewing experience. Downside of HDR10+ is that it still uses 10-bit color depth and not 12-bit which Dolby Vision offers. Many TV providers label their HDR as HDR Pro or HDR Premium. This is simply a marketing gimmick and are just HDR10 and not anything more from a specification standpoint. Only HDR10+ is something genuine given its dynamic meta data processing capability. HDR formats which we discussed so far are for content to be shown post production i.e after the complete shooting of the movie or an episode of a show. This is often in the form of web series from OTT providers or in a form Movie in a Blu ray disc format. Live TV shows showing visuals from a live scene do not support HDR. This is the area where BBC from Britain and NHK from Japan have worked together to bring broadcast TV content with the goodness of HDR in the form of HLG aka Hybrid Log Gamma. The issue with currently available HDR formats, primarily HDR10 and Dolby Vision, lies in their difficulty to broadcast. The problem lies in metadata. Because with broadcast, there’s high likelihood of metadata getting lost during the transmission or becoming out of sync causing issues with the video rendering at the user end. Moreover, it needs much bigger bandwidth, something which broadcasters are restricted with. They have a very finite spectrum of bandwidth. This is precisely what HLG format tries to fix by removing metadata and using a different encoding technique. One big advantage with HLG HDR format is its back-compatibility. Meaning it would work with non-HDR TVs too. Well, that doesn’t mean the non-HDR TV would show you HDR content, but it would simply show in standard definition. This is something significant given that HDR10 or Dolby Vision are not reverse compatible. TVs without HDR capability when supplied with HDR content would not be able to understand HDR signal and won’t display any content. But do bear in mind that unlike the popular HDR formats, no HLG TV shows or movies are available yet. TV broadcasters in India are generally laggard when it comes to innovation, so I don’t see any channel streaming HLG content in the imminent future. Industry experts believe it is possible to add HLG capability to the TV provided it has requisite hardware and HDR via a firmware update. So, this is a good thing which implies even if your TV is not shipped with HLG HDR, you might still receive support for it via OTA (over-the-air) if your TV manufacturer really cares about you. High Dynamic Range (HDR) is a lot more complex than just three innocuous words. But then it’s also a promising technology that will immerse us deeper into the spectacular movies and TV shows we love to watch by reproducing realistic imagery through range expansion. HDR adds in additional colors and improves clarity in shadows and highlights. Though these improvements sound subtle but are significant. Going for HDR is better than having a larger resolution. Because HDR delivers a much more visually satisfying picture than simply having extra pixels. Overall effect of HDR results in punchiness of picture that you’ll find in a 3D picture. If you’re still wondering if the next TV you buy should be HDR compatible, my recommendation would be a yes. There is a caveat though: HDR is an end-to-end technology. Every step from creation to reproduction on the TV screen in your home needs to be HDR-compatible. Also, for a better utility of HDR, make sure your TV offers a good level of peak brightness and if its Dolby Vision compatible ensure that the screen supports 12-bit color depth.